We were transported to North London for an overnight stay. I think it was RAF Northolt but it could have been Hendon. Anyway, the next day we were bussed to RAF Stanstead where civvy aircraft flew troops overseas. Unfortunately on arrival, we were told that the plane was not ready so they took us into Bishops Stortford and left us to our own devices until tea-time when we were picked up and returned to Stanstead, a small airfield then with little huts and nissen huts for administration purposes. A great deal different to the set-up these days. We were taken out to the Avro York sitting on the runway bearing the name (which I cannot recall) followed by the letters II meaning, I presume, the second. We had a stewardess ushering us on board so I said `what happened to the first one then ?` to which she frantically put her fingers to her lips saying "SHUSHHHHHHHH" I never did find out. The flight was made out over two days. I was sitting against the cabin bulkhead and there was no door, just a curtain so I had a good view of the controls and cockpit dials whizzing round. A seven hour flight brought us to Malta in the middle of the night to be followed by a mad cap cross country ride in one of the ill reputed local, hard wheel buses to sleep over at an army transit camp. I was woken early next morning by the soon to be familiar middle east fly which crawled over my face until I jumped fully awake then it proceeded to go along the line of beds waking up everyone else too. An early breakfast saw us on our way for a further seven hour flight to the Suez Canal Zone over the North African coastal area. This was 1953 and across the desert we could see lines of tanks and wrecks still littering the desert, the aftermath of the WW2 conflicts of the Eighth Army against Rommels` Army. I was navigating using a small Letts pocket dairy which had small maps of the world depicted. As I tracked our flight over northern Egypt, I had been looking for signs of the Pyramids and suddenly I could see them looming up out of the ground haze. I called out "there are the pyramids" and suddenly every one crowded over to starboard to view the magnificent sight. Suddenly a stewardess came screaming down the kite "get back, get back, you`re tipping the airplane over" I kept quiet after that until we touched down at RAF Fayid. A quick picture taken while crossing Malta to Luqa Airfield. Malta then looked dry, rocky and dusty. May 16...2011 Eric Todd just sent me the above picture he took from the bus as he crossed Malta just like we did in 1953, on the way to Luqa Airport to resume his flight to Egypt. The topography almost matches that of my picture above ( but clearer ) and we both must have pressed our shutters near the same spot. What a co-incidence !!! This pic is on Eric`s page together with a couple of overhead shots of Valetta harbour. It was Saturday when we pulled into RAF El Hamra, a small transit camp where we found that no beds were available for us. All we got was a blanket and instructions to kip on the sand in the backyard of the transit office. I used my kitbag as a pillow and woke with a stiff neck because I had laid on the full size UK electric iron I had in my kitbag. Next day we were told we could go through the camp opposite to the lido on the Great Bitter Lake for a swim. I dived off the jetty into the treacly warm water and surfaced face to face with Graham Cox from my home town !!! He worked in the Kasfareet cookhouse. Back in El Hamra next day, excitement mounted as we awaited our postings. Would it be Cyprus ? Malta ? East Africa ? not on your nelly. Nearly all of us were allocated to 107MU in RAF Kasfareet just over the bloody road. Out of all the 100 trades we understood were available to all, we had all been neatly steered to Kasfareet for the rest of our service. Door leading through to cockpit. I occupied one of a pair of seats on the left, just in front of the fire extinguisher. There was no fixed door, a curtain separated us from the flight deck. 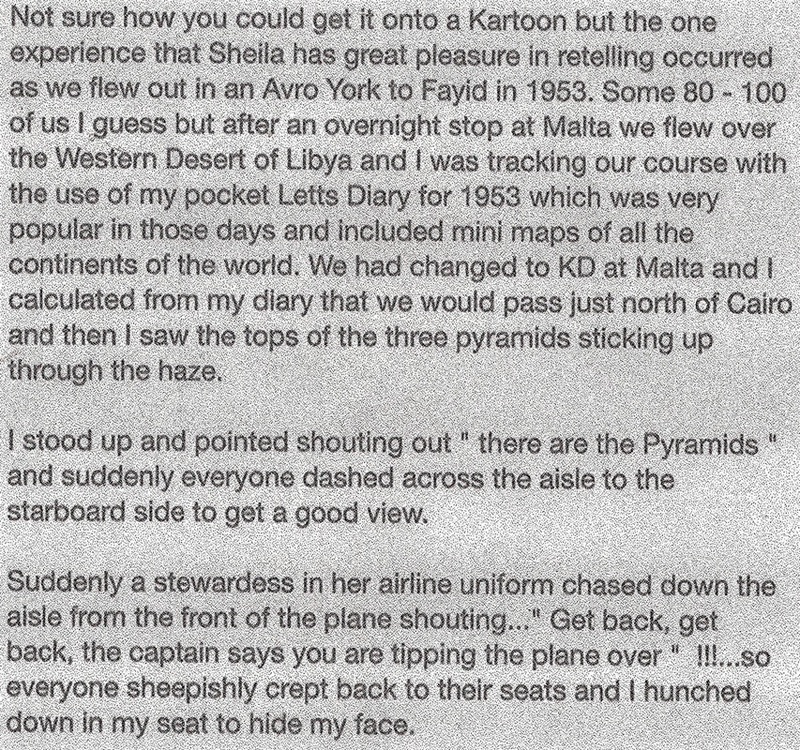 It was from that seat that I got my first glimpse of the Pyramids of Ghiza and sparked panic among the aircrew. 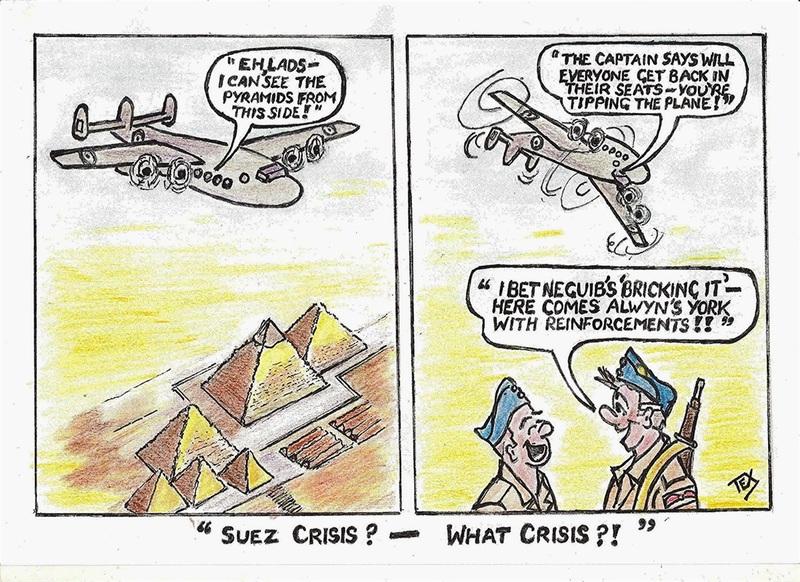 See bottom of this page for Tex Williams recent great cartoon portraying that moment. Looking through the door. The pilot`s seats were raised above the instruments you can see. This gives a better view of backs of the raised seats. 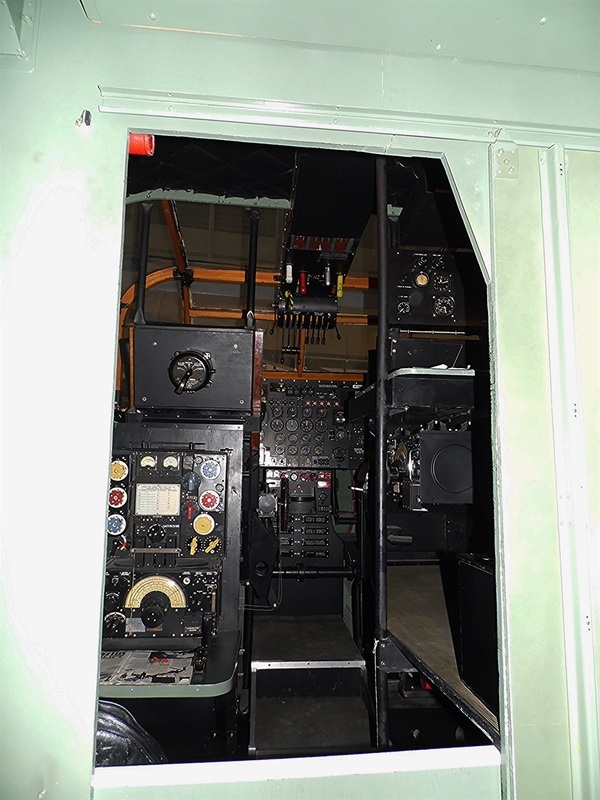 The main control panel is centre and engine control arms etc suspended centrally from the roof of the cabin. Looking back toward the rear of the aircraft. The seating arrangement was a central walkway with pairs of seats both sides stretching from front to rear. One of the first things I did was to buy a small translation book. I never did learn to talk like an Egyptian.